The Motorola One Power is powered by a massive battery backup of 5000 mah, with which you can enjoy up to two days on a single charge. The battery features turbo power technology that gives you up to six hours of power in just fifteen minutes of charging. With its Max Vision Full HD+ screen, the device delivers the expansive views you’ve been craving. Unlike traditional displays, Max Vision gives you a 19:9 aspect ratio, so you can see more at a glance. It comes with an amazing rear camera configuration with which you can even shoot 4K videos without any fuss. The Motorola One Power is launched in India. The handset has a 6.2-inch full HD+ Max Vision display with a 19:9 aspect ratio. It is powered by an octa-core Qualcomm Snapdragon 636 processor that is coupled with Adreno 509 GPU, 4GB RAM, and 64GB default memory capacity. This storage can be expanded up to another 128GB with the help of a microSD card. The phone sports a dual-rear camera at the back with 16MP + 5MP combination. The native camera app also provides a fully-featured manual mode for tweaking shutter speed, ISO and focus. Up front, the smartphone from Motorola makes use of a 12MP (f/2.2) camera with LED flash. Connectivity options on board the One Power include WiFi 802.11 a/b/g/n/ac, dual-band, WiFi Direct, hotspot, v5.0, A2DP, LE, EDR, 2.0, Type-C 1.0 reversible connector, with A-GPS, GLONASS, BDS, and dual Sim. The mobile gets power from a non-removable Li-Ion 5000 mah battery and runs Android 8.1(Oreo) out of the box. Sensors include a fingerprint, proximity, compass, an accelerometer, an ambient light, and a gyro. The phone is available in the Indian market in Black color. The Motorola One Power price starts at Rs. 15,999 for 4GB and 64GB variant. Motorola One Power latest update improves system stability. The new update which the smartphone is receiving is said to be the December 2018 Android Security patch and it brings along certain tweaks along with it. 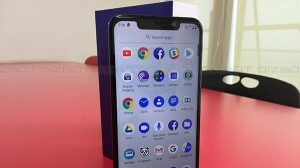 Motorola One Power receives Rs 1,000 price cut as a part of upcoming Flipkart Big Shopping Days sale. The discount is being offered as a part of the Flipkart Big Billion Shopping Days Sale which will be live from 6th December to 8th December 2018. Android 9 Pie update for Motorola One Power, Motorola One rolling out globally. Motorola took it to its official website to release the notes on Android Pie update for both Motorola One Power and Motorola One smartphones. Now grab Motorola One Power at as low as Rs 1149 during Flipkart Mobiles Bonanza sale. Here how to avail the offer.